These are the frequently asked questions and answers about our site, forum and, community. A general FAQ of community guidelines is available here. What is the the purpose of this site/forum? 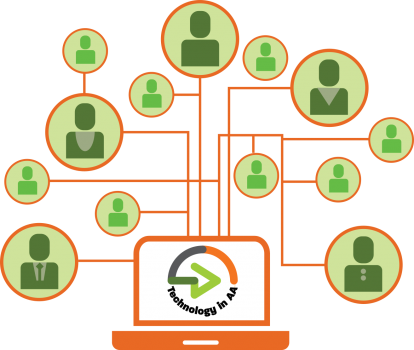 This forum is for AA members to share about using technology for accomplishing the primary purpose of AA. Who can sign up and be a member of this forum? Any member of Alcoholics Anonymous is welcome to join the forum – whether you have a technical background or not. Also, if you’re not a member of A. A. but are supporting A. A. service work (either as paid or volunteer staff or serving as a non-member board member of an A. A. organization), you are welcome to join as well. If you wish to receive an invitation, you can request one here. The current statement of our membership policy is located here. Who manages and makes decisions for the forum? A rotating administration team is responsible for the general maintenance and evolution of the site, including the forum software. We intend to manage and operate the site in accordance with AA principles. Where decisions affect the forum community as a whole, the admins will, at times, create a poll and ask active members for their input. In addition, we are in the process of creating an organization which will have oversight of community policies and priorities (again, consistent with AA principles of organization). This organization will also allow the forum to survive past it’s founders by maintaining a structure, bank account, etc. Our hope is to realize this organization in 2019. What are contributions to this forum used for? All contributions are used to purchase and maintain the software and services (e.g. DNS listings, hosting, purchased software, etc.) used to keep the forum up and running. A full accounting of our expenses and contributions are available to members. How are decisions about spending made on the forum? Currently, the forum administrators discuss and set forum priorities, including spending. It is expected that eventually (probably in 2019) there will be a new rotating leadership who will be accountable to the forum for financial decisions. All contributions and expenses are tracked in accordance with our funding statement and reported on this spreadsheet. Why are contributions accepted only from forum members? In accordance with AA’s 7th tradition, which states (in the short form) We are “…self supporting, declining outside contributions,” we feel that only forum members should contribute to it’s support. How can I change my contribution or subscription? We are working on a way for members to change their contributions or subscriptions as they wish. At this point though, an administrator will need to cancel/change contributions. You can initiate this at any time by sending an email to info@tiaa-forum.org. Please do not place your credit card information in this email!!! When we receive your request, we will get back to you as soon as possible.